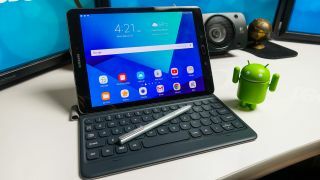 The Samsung Galaxy Tab S4 has been rumored for quite some time, though only now are we hearing some more concrete details leaking out. Latest amongst the mumblings is news of a new iris scanning ability, much like what we’ve seen on Samsung’s phones going back to the Galaxy S8. Also borrowing from its remarkable phone design, the company is said to be reducing bezels to really let the screen take center stage, as Apple is also rumored to do with the next iPad. Where does that leave the home key that has traditionally housed the fingerprint scanner? We’re currently not certain, but it may shift to the side or rear, or Samsung may lean in completely on its iris scanning tech as its sole biometric. Not only is the upcoming tablet all but guaranteed to look a bit different than before, it will likely be more powerful, too. Rumors state that it will harness the power of the Snapdragon 835, 4GB of RAM and will run with Android Oreo 8.1. It’s said to utilize Samsung Dex, according to SamMobile, though it’s not clear how it will be setup to work with a monitor. This could very well be an announcement saved for IFA 2018 in September, though with Apple’s new tablet reportedly coming soon, Samsung’s latest had better be worth the wait. Could the Tab S4 dethrone the best tablets?